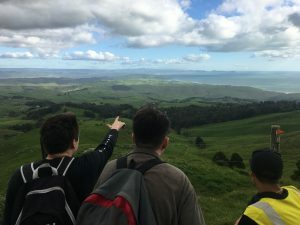 We are co-creating the Maanaki Ao programme together with A Rocha Aotearoa NZ and Papa Taiao to deliver an environmental and outdoor education program for Year 11 to 13 students. Throughout the programme students will participate in practical, hands-on activities in challenging physical environments and gain both NCEA Unit and Achievement Standards at Level 2 and 3. The programme is based on a student-led, inquiry-learning, curricula-integrated philosophy – an approach designed to enable students to grow in confidence, leadership and develop work-ready skills. In an outdoor living classroom students will be introduced to a variety of local environmental issues/human impacts and will explore various solutions to these. Teams of students will identify issues and develop sustainable actions to address these. This will involve teamwork, project planning and management, fundraising, developing a business plan and practical implementation of their chosen solution. The program will provide opportunities for further study, career pathways or work placements in the environmental / conservation / geography and science fields. Awareness of the natural environment and related issues. Knowledge and understanding of the natural environment and human impacts. Positive attitudes and values about the natural environment. Skills involved in identifying, investigating, and problem solving associated with environmental issues in the areas of marine, freshwater and terrestrial environments. Skills involved in project management, environmental monitoring, evaluation and reflection. A sense of responsibility through participation and action as individuals or groups in addressing environmental issues. One term introduction to the Academy programme through the Horticulture class. Students learn teamwork, basic outdoor skills and explore biodiversity challenges in forest, freshwater and marine ecosystems. Topics include; bush survival skills, outdoor navigation, outdoor first aid, predator monitoring, water quality monitoring and impact assessments of plastic in the marine environment. Full year Academy programme to address the impact of predators on native biodiversity in a coastal forest (at least 14 NCEA credits). Teams of students will run a multi-species predator control operation to protect seabirds. Together, they’ll be encouraged to think creatively to solve challenges, to project plan, manage, monitor, evaluate and reflect on the success of this program and the impact of their personal action. Our Plastic Oceans – addressing the issue of plastic waste in our oceans/coastal environments by exploring local impacts and solutions. 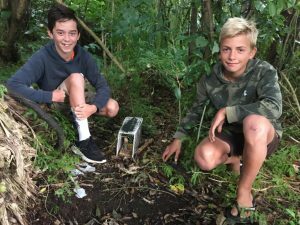 Predator Free NZ – exploring innovations and solutions to reduce predators in our local environment. Stream Forensics – using a national monitoring tool – Stream Ecological Valuation (SEV), to assess and implement solutions to water quality issues and impacts on mahinga kai. Students develop an understanding of ecosystem services and may recognise restoration opportunities for the streams explored by identifying categories that have low scores. Manaaki Ao staff and the School Principal are responsible for the selection of students who enter the course. There is a high expectation of attendance and some after school hours are expected to be contributed on a Friday afternoon (11 am – 5 pm) . The course is both practical hands on but is also set up for academic achievement in a supported environment to gain NCEA level 2 and 3 (with university entrance). If you would like to apply, download our Application Form.